Positive relationships in the workplace have never been more important than in today’s fast-paced and competitive marketplace. 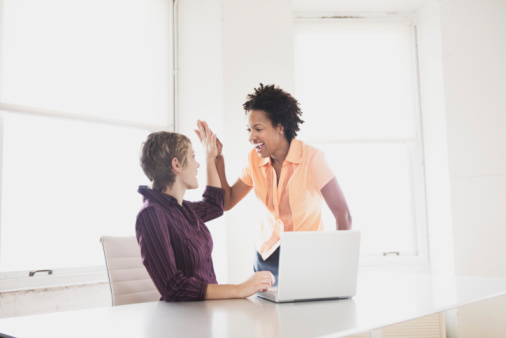 At the end of the day, your success often depends on your co-worker’s willingness to partner with you. So it’s essential that your colleagues feel you are thankful for all they do. It helps to pay attention to the type of thanks that best resonates with your teammates. Then, consider which of these would appeal most to them as individuals. Most people love compliments, especially when they are genuine. Just saying “I really appreciate all you did for this project” can make someone’s day. It’s even better if you do so within earshot of the boss, such as a compliment passed along in a staff meeting. Some people are embarrassed by any kind of public display of attention. It’s just the way they are built. For those co-workers, consider sending an email and copying the boss, if your team has access. If a co-worker has really gone an extra mile so that your whole team can succeed, consider sending a greeting card or eCard to make them feel appreciated. Every workplace has days when one person on a team is deluged with tasks, works late, and feels under pressure. That’s when a random act of kindness is a perfect way to show how you value their efforts. It can be as simple as offering them a hot cup of coffee, a cold bottle of water, or their favorite candy bar from the vending machine. Don’t be surprised if your thankfulness comes back to you in unexpected ways. Thankfulness tends to be contagious, and your co-workers will likely be inspired to pass thanks along.